Open source code in VB, C, etc. Are you wanting to automate a task but don't know how? Have you looked through motion control catalogs and been shocked by the unnecessary complexity? Most vendors expect you to select and match motors, drivers, power supplies, and cables, then write your own software or live with their proprietary product. The C4/MD2 system cuts through the confusion and offers a complete programmable motion control solution for those who don't want to design their own, or don't have time to waste. The C4/MD2 Dual Stepper Motor System contains everything you need to accomplish motion control with PC - no cards to install, no cables to build, and no components to match. Simply connect to a RS-232 or USB port on your PC or other controller, load the software, and GO! Within minutes you'll have complete control over the direction, position, and speed of each motor. 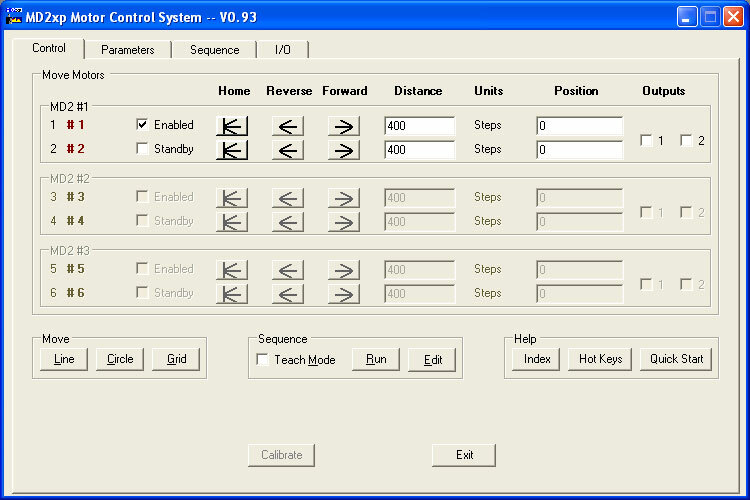 Programming is simple with our interactive motion control program. Custom programs are easy to create using our subroutine libraries for C and VB. Source code included! There are 2 motor sizes to meet your torque requirements. Each C4/MD2 system includes the MD2 driver/power supply, C4 intelligent controller, USB/Serial converter, 2) stepper motors, 2) 10' motor cables, 2) home switches, PC-based software and documentation. The C4/MD2 system can be operated from an AC outlet or from a battery. Use the C4/MD2 system to control our XY positioners. Increase the torque and resolution of a stepper motor using our PR23 Pulley Reducers. View the C4 Controller User Guide (2mb pdf) and the MD2 Driver User Guide (.5mb pdf). Need assistance? - Contact us now, we'll be glad to help. A stepper motor is a special kind of motor that moves in individual steps which are usually .9 degrees each. Each step is controlled by energizing coils inside the motor causing the shaft to move to the next position. Turning these coils on and off in sequence will cause the motor to rotate forward or reverse. 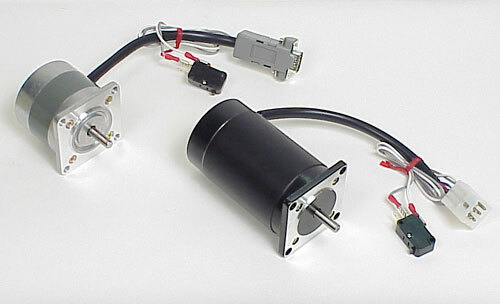 The time delay between each step determines the motor's speed. Steppers can be moved to any desired position reliably by sending them the proper number of step pulses. Unlike servo motors, steppers can be used "open-loop" without the need for expensive encoders to check their position. Stepper motors are much more cost-effective than servo systems due to their simplified control and drive circuitry. There are no brushes to replace in a stepper motor, eliminating the need for maintenance. Even though a stepper motor system can not achieve the speed of a servo motor system, their ease of use allows them to be the preferred solution for many of today's computerized motion control systems. Learn the differences between stepper motors and servo motors. Each MD2 system comes complete with our MD2xp interactive motion control program which gives you complete control of up to 6 motors (3 MD2 systems) from a single computer. Motor parameters are easily changed and saved, and motion control programs can be created manually or by using the automated teach mode. 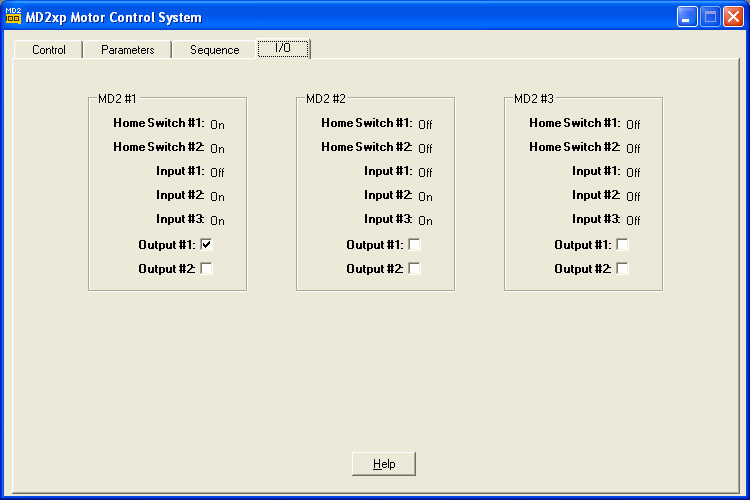 The MD2xp software works under all versions of Windows via the USB or an RS-232 serial port. Other systems such as Macs, Linux-based PCs, and even tiny microcontrollers can also be used by sending simple commands through their serial ports. Need to know what units conversion is, or how to home a motor? Just click the help button and select from the menu. The text is short, and to-the-point. Easily move motors using keypresses, a joystick, or a gamepad. The MD2xp program will perform single and dual-motor moves, including linear and circular interpolation, and XY grid pattern moves using row and column numbers. The powerful teach mode feature creates programs automatically as you control motors via the keyboard or with mouse-clicks. These BASIC-like programs can be maintained with the editor, saved to disk, and recalled whenever needed. Programs can change motor parameters, perform multi-axis movements, control outputs, read input signals, perform loops, and call subroutines. Quick-Run buttons load and run a sequence with a single click. Don't get locked into proprietary software that you can't customize. 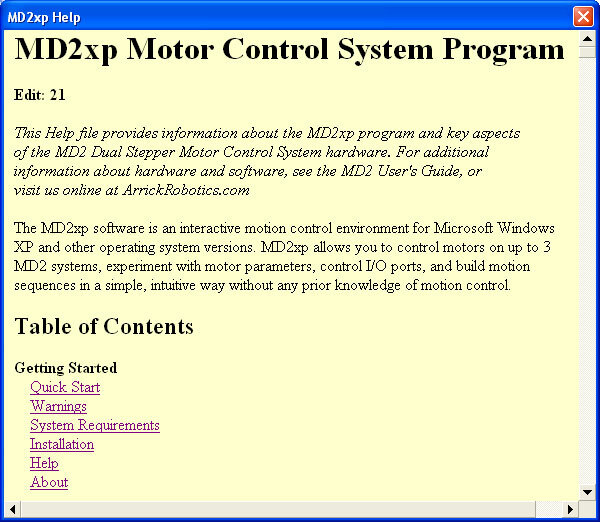 The MD2xp program is written in Visual Basic .Net and the source code is supplied with the system. This lets you create customized programs easily, and have ultimate control over your project. Nested loops, gosubs, output control, etc. On-Line Help - Short, and to-the-point. The C4/MD2 system also includes a complete set of subroutine libraries written in VisualBasic. 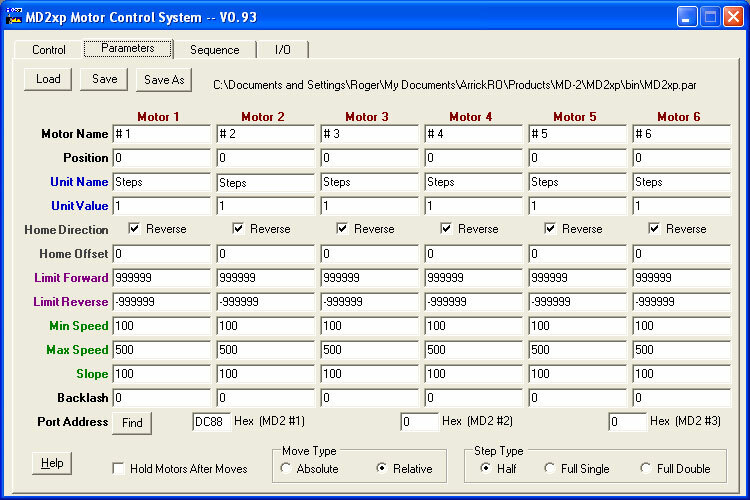 This allows the creation of custom motion control programs, which provide the features and user interface you desire. The subroutine libraries can be used in conjunction with libraries from data acquisition products to solve complex control and automation tasks. Other languages including C, C++, C#, Perl, etc can easily be used by sending simple text commands through a serial port. 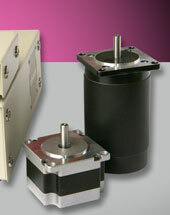 We offer two sizes of C4/MD2 systems - the difference is motor torque. Each C4/MD2 system contains drive electronics, 2-stepper motors, 2-home switches, 2-10' motor cables, a printer port cable, MD2 software, subroutine libraries, and extensive technical documentation. An input/output port is included on each unit. This gives the user 3 digital inputs and 2 digital outputs to attach to external devices such as cutting motors, lamps, lasers, limit switches, or level sensors. The torque curve charts below can be used to determine the available torque for any speed. As you can see, torque decreases as motor speed increases. Motor torque can be increased by using our PR23 pulley reducer. The maximum speed that your application can operate at depends on many factors including payload, friction, and acceleration. It's best to have 30-50% more torque than required. Feel free to call us to discuss your torque requirements. C4 is an intelligent motion controller that sends pulses to one or two MD2 drivers (4 motors). C4 accepts short, simple commands from the host via an RS232 serial port and handles all of the timing functions needed to coordinate and control motors. Any host with an RS-232 port (or USB with the provided converter) can talk to C4. Normally the host is a PC, but it can also be a Mac or even a small microcontroller like a Basic Stamp. Multiple C4's can be controlled by a single host, either by daisy-chaining the serial port, or by using multiple USB ports and converters. C4 does not drive stepper motors directly, that is the job of the MD2 driver. Learn about C4's simple, powerful command structure in the User Guide. The MD2 contains the power supply and drive circuitry for 2 stepper motors. The MD2 must receive real-time control pulses from an intelligent controller such as C4 to operate. The MD2 driver has been available for many years and in the past software was provided that turned a PC and its parallel printer port into a controller. Modern Windows operating systems and the demise of the printer port now require use of a separate controller such as C4, but that has many advantages including smoother motion and relieving the PC for other tasks. See the MD2 User Guide. If you already have an MD2 driver, you can purchase a C4 intelligent controller for use with it. The C4 controller gives you USB/RS-232 connectivity, smoother motion, simplier programming, 4-axis interpolation, and frees your PC for other tasks. 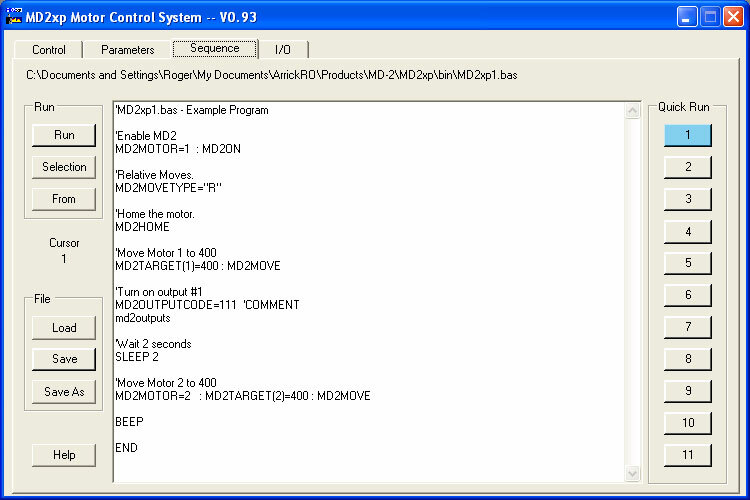 A C4 controller will control 2 MD2 drivers (4 motors), and many C4 controllers can be connected to a single PC. There are 2 MD2 sizes to choose from. Notice the different torque values. linear and rotary positioners with moderate payloads and speed. our X and XY positioners to move larger payloads faster. * Most applications use speeds of 2000 steps-per-second (300RPM) or less because the motor's torque tapers off at higher speeds. Increase torque and resolution by using the PR23 Pulley Reducer. For 220VAC (50/60hz) operation place '-220' after the part number. User must supply IEC power cable and plug converter for non-US power sockets.